All Hail the Mighty Beech Tree. There was a big wind storm last week, it finally blew the remaining leaves off the trees. This time of year when it becomes cold and sunny I like to walk in the parks and along the streets and enjoy the bare trees and their forms. 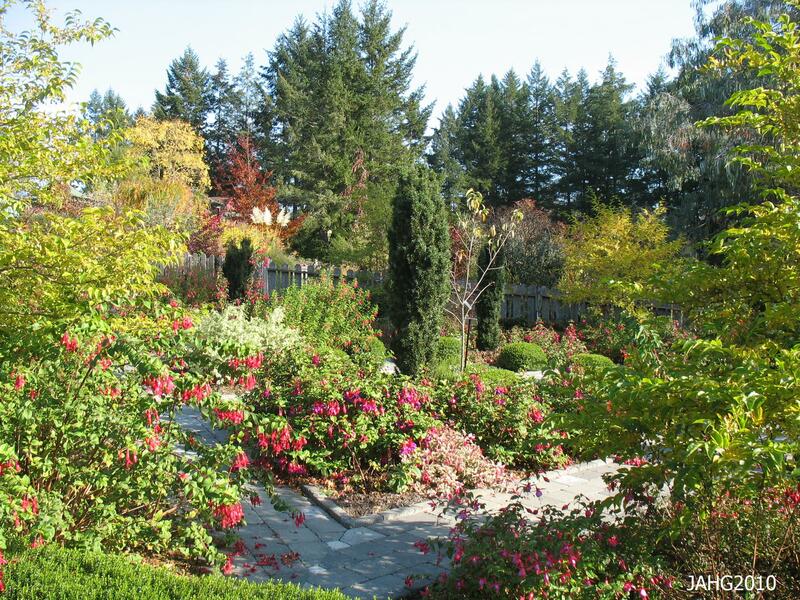 It reminds me of when I was in school learning about the trees and shrubs commonly grown here. 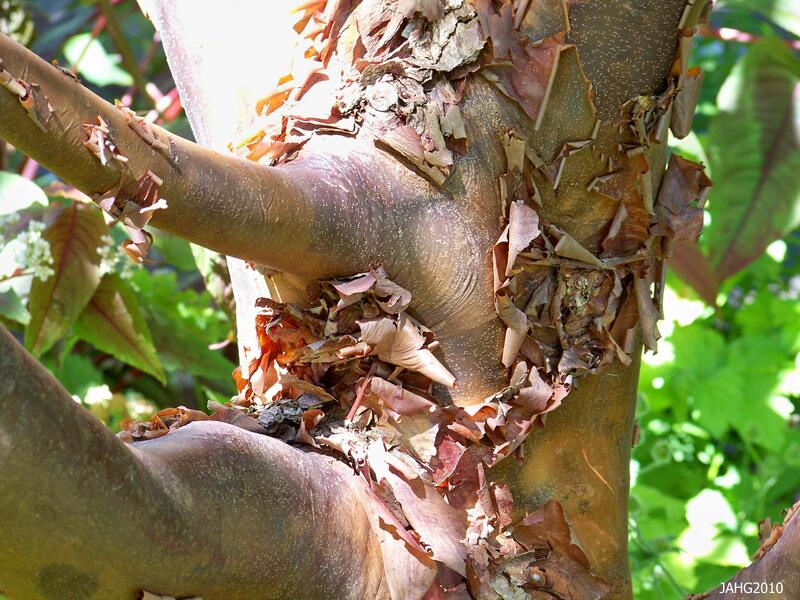 I gained a new appreciation of the bark and buds and the variation that there is. One of my new favorite trees has long sharp buds and smooth grey bark which is seen as perfect to carve your initials in. The Common or Copper Beech (Fagus sylvatica) is the tree I am referring to and long may they live. 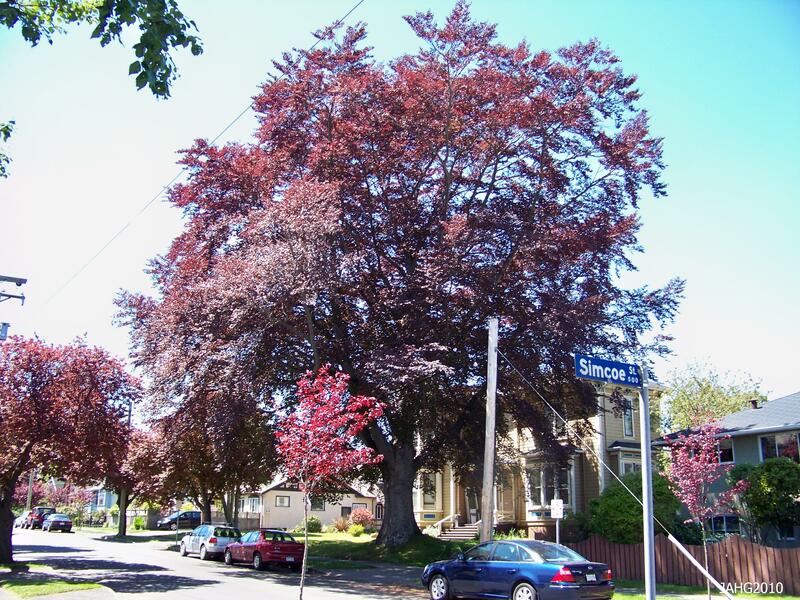 This large purple form Copper Beech was probably planted when this house in James Bay was built in the early 20th century. Fagus sylvatica are a European tree and are found growing in most areas from southern Sweden south to central Italy, west into France and northern Portugal and Spain. In the east they are found in north-west Turkey where they meet out with Fagus orientalis the Asian representative of the species which they hybridise with. It is interesting that in England where Beech Trees are most often associated with, it is one of the later places that they naturalized in reaching there after the last ice age. We are not sure how they got there but it is possible that came with early people who may have brought the seeds as a form of food which was highly nutritious and transportable. 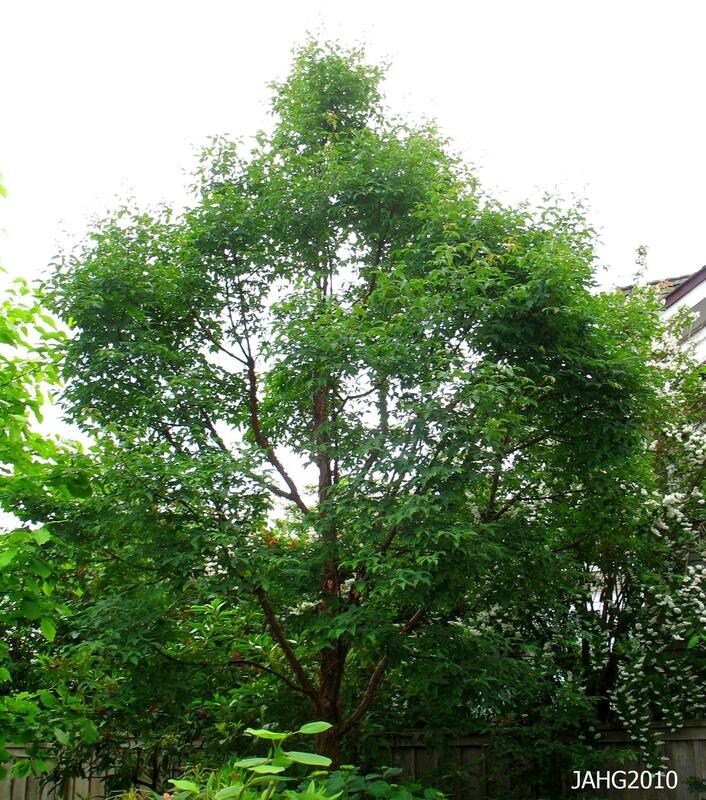 This green Fagus sylvatica tree will produce a fine crop of beechnuts which were at one time eaten as emergency food. 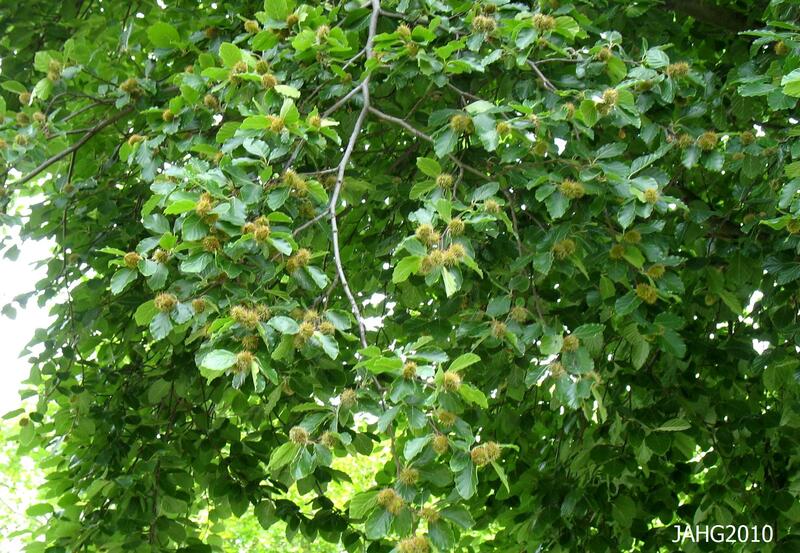 Common Beech trees have provided many sources of useful goods over the years. Very early on the bark was used to carve runes. The wood is brittle and has short grains and is not strong or durable. It is more used for handles, small articles, turnery, parquet flooring and Bentwood furniture. Charcoal made from the branches was used for coloring and gunpowder production. The wood is considered one of the best for burning as fuel as it gives one of the highest volumes of heat. 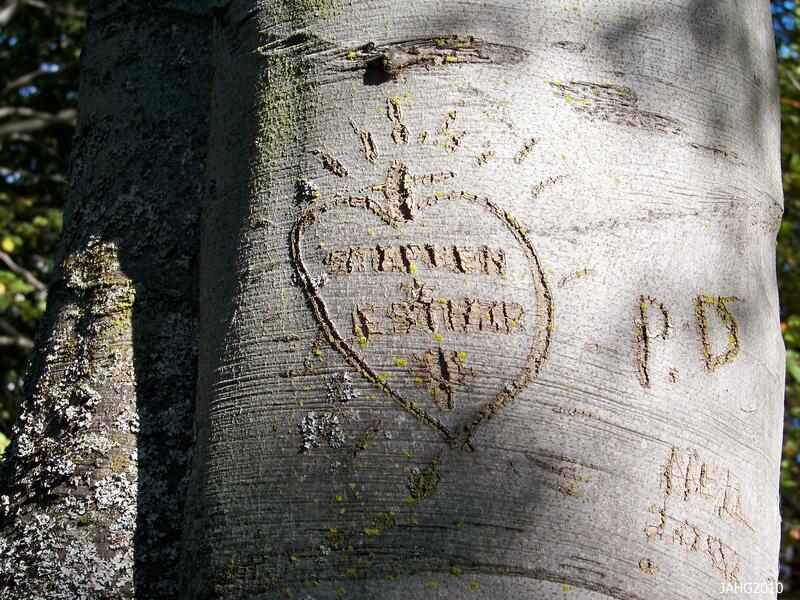 The fine smooth bark of the Beech tree has always been carved on, you can find this example at St Ann's Academy. The seeds of Copper Beech have been used for emergency food in the past and processed into flour. Eating large amounts can be slightly toxic due to the tannins found in the seeds. Mostly the nuts have been used for feeding woodland animals and pigs, chicken and turkey for commercial use. High quantities of oil can be extracted from well-ripened nuts(17-20%) and was used for food and heating in the 19th century. Mainly the use of trees now is ornamental now. 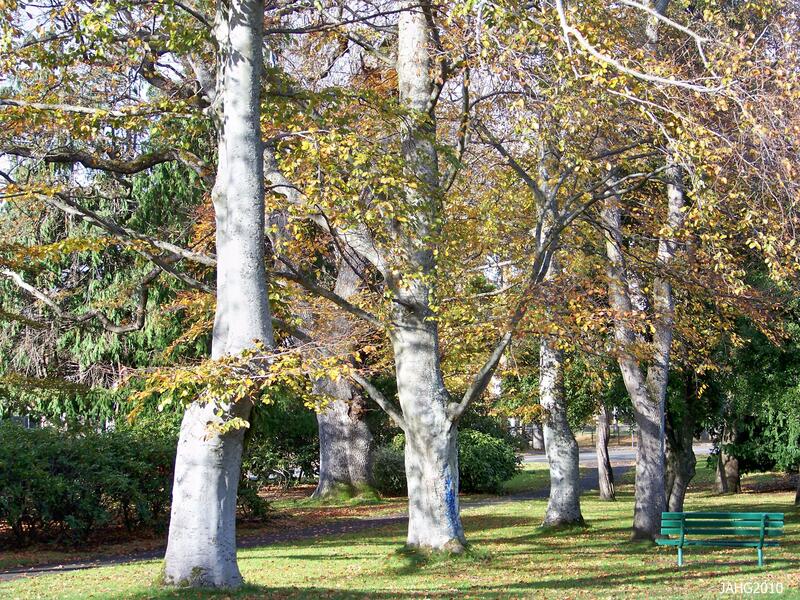 This fine trio of Beech trees are found in Beacon Hill Park near Blanchard and Southgate streets. Now we associate the Copper Beech with large estates and parks and institutions which have the space and maybe are old enough to have large specimens of these trees. When in the open and not competing for sun the become truly huge trees which have many delicate aspects to them. The leaves are small, thin, fine, glossy smooth and at all times of the year are beautiful to look at. They have brilliant color when emerging from their tight sharp pointy buds in the spring and later in autumn turn golden and coppery. 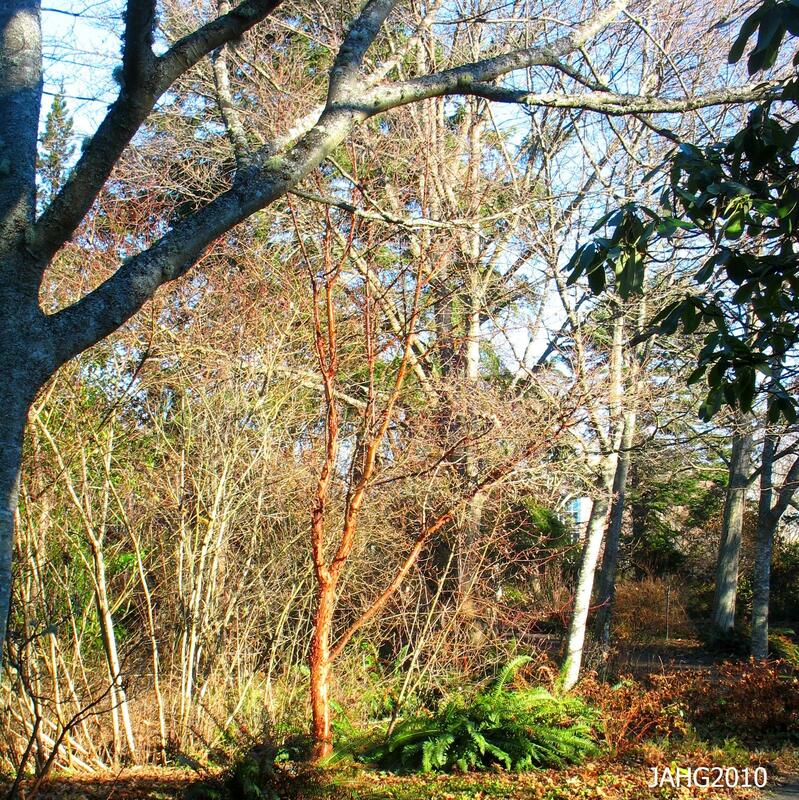 In winter the leaves of young trees may stay on the tree and protect it, their coppery color is an unusual site as well as sound in the wind. The branches are also fine and thin giving the tree an overall delicate feeling. The fine, thin, pointy-sharp buds are a distinct feature of Fagus sylvatica. 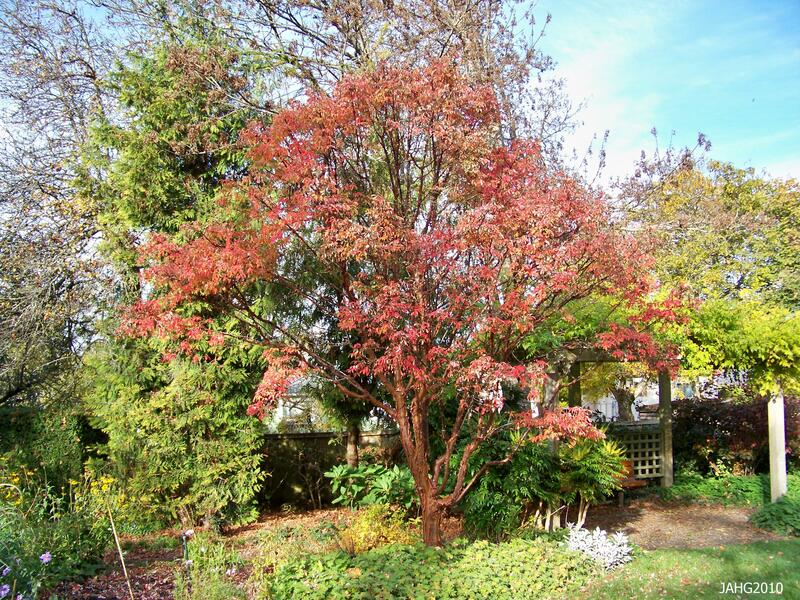 The Copper Beech makes a fine tree for a larger property or garden. 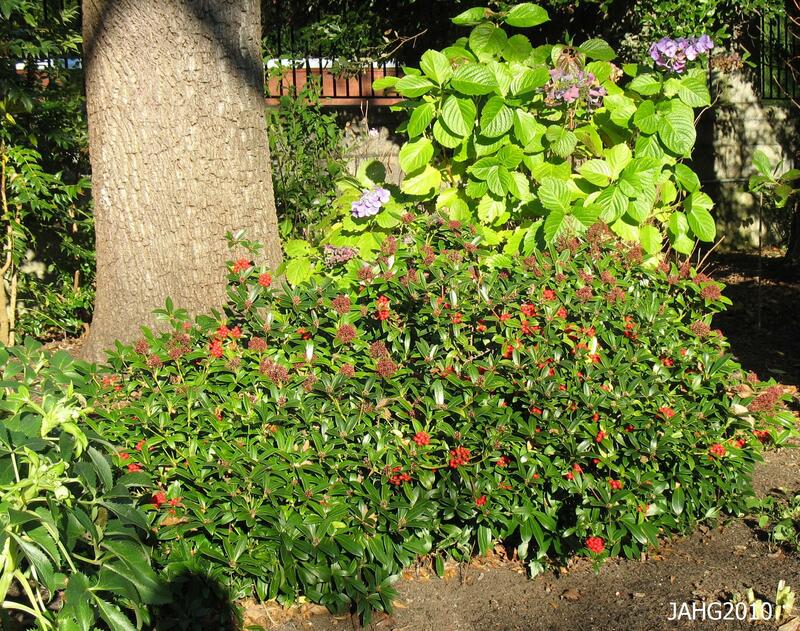 The like to grow in an area with good humidity or some precipitation throughout the year. They like well-drained soil which is slightly on the acidic side but will tolerate chalky soil as long as it is not clay heavy. Beech grow their best and reach their full potential in a site which gives them full sun. The roots are shallow and help keep the soil around them more fertile by absorbing large amounts of potash which is stored in the leaves of the tree. There are many fine forms of Beech including this rare golden leaved Fagus sylvatica 'Zlatia' is found where Begbie and Pandora streets meet in Victoria. Common Beech grow to be massive trees over many years and can reach 43m(140ft) high by 40m(130ft) wide. They are rated as slow growers but like most trees grow faster when very young. They are quite cold hardy and are rated as zone 5 or tolerating 25c(-20f) with some cultivars being slightly more tender. 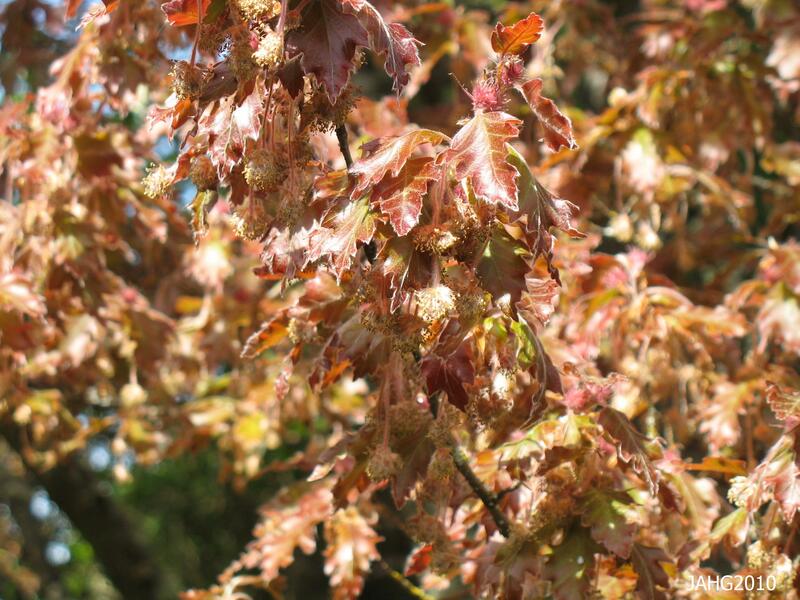 Many fine forms of Fagus sylvatica have been selected including 'Dwyck' which comes in green, gold and purple. 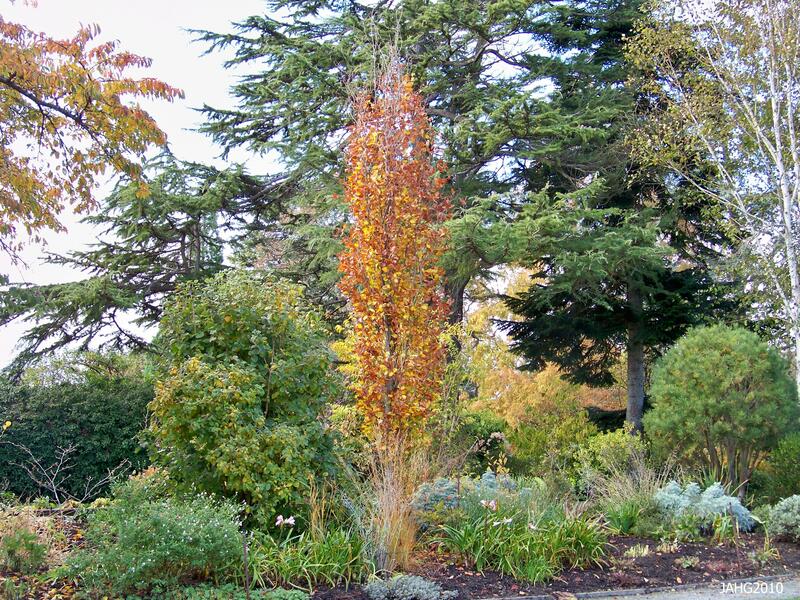 As Fagus sylvatica have been grown since ancient times many fine forms are available for enjoyment in your garden. You can choose from color forms of green, golden, purple, rosy and even variegated. Their several narrow forms which are much used as street trees. Weeping forms are often seen as specimens and come in very spectacular in the right setting. There are also interesting leaf forms such as ‘Asplenifolia’ or ‘Rotundifolia’ and the ‘heterophylla’ group. 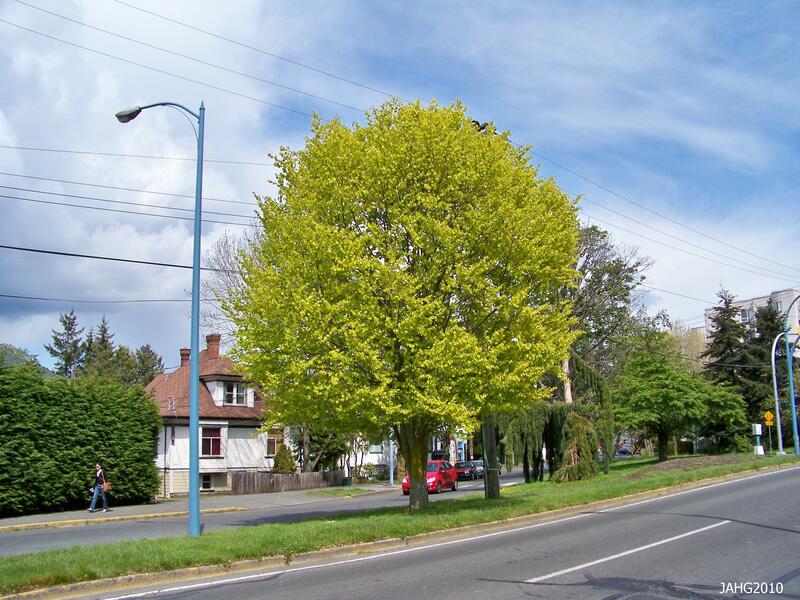 These trees are usually used as specimens or accents, the make excellent park and street trees as they have few pests or disease and are long-lived. 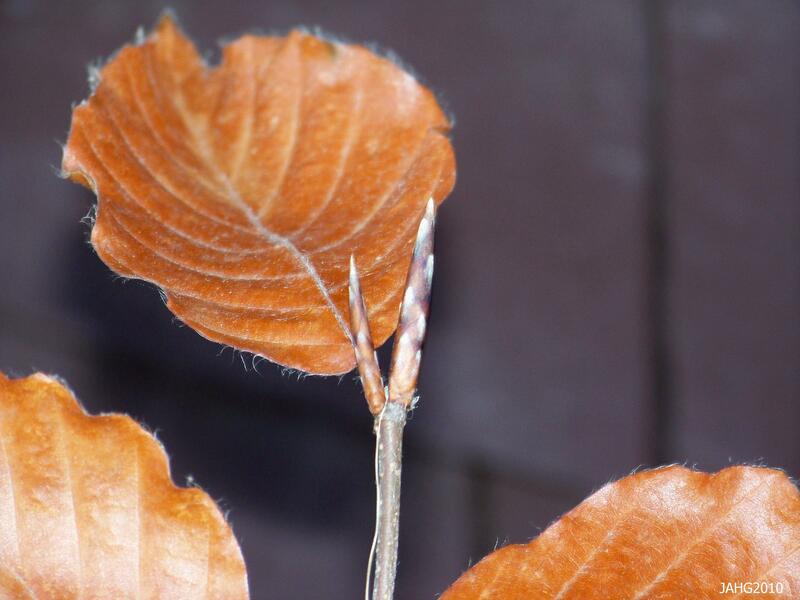 Named varieties of Beech trees are usually grown from cuttings that are grafted. You can also grow them from seed which can be collected and stratified at home. These leaves are from Fagus sylvatica 'Heterophylla' and the male flowers are seen blooming. Lords and Ladies May I present An Italian Cuckoo Pint. There are some plants that are just plain strange! Even the family(genera) they are associated can be weird. Many of these peculiar plants have unusual flowers or growing habits because they might live in unusual situations or bloom out of season when there are few bees to spread the pollen. One family with strange flowers is the members of the Araceae family. 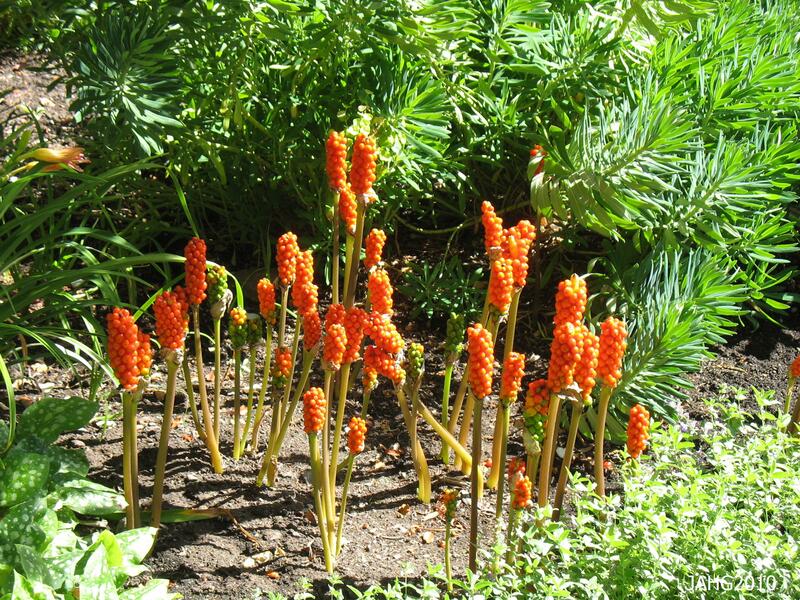 The namesake of this family is the species Arum and the most common type seen in gardens is Arum Italicum (Cuckoo Pint). This Arum italicum with its freshly unfurled leaves and bright seeds is a showy addition to the late autumn garden. The Cuckoo Pint is one of the best known members of the Araceae family which all have several characteristics in common. 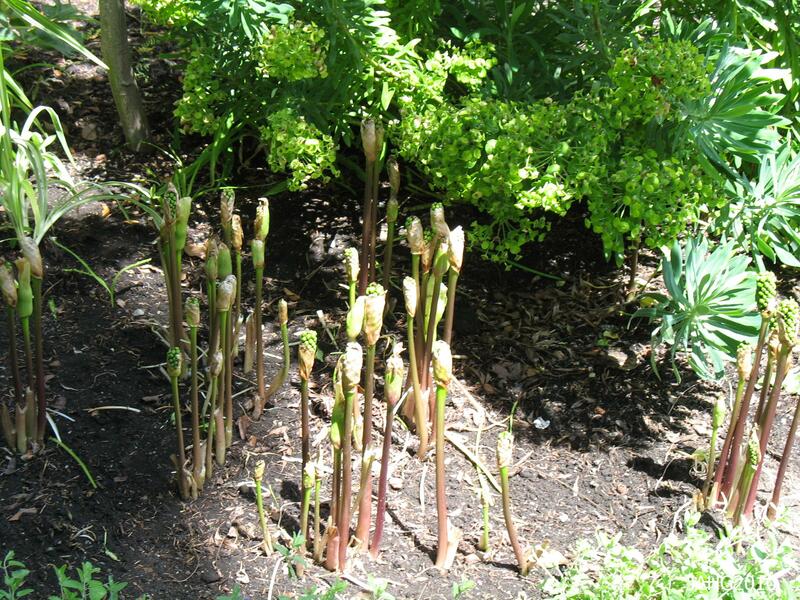 All members of the family have spathe/spadix flowers which make them stand out from other plants. The spathe is a specialized leaf which protects the spike(spadix) of tiny flowers. The spathe is generally much larger than the complete spadix and is often showy and can be colorful. 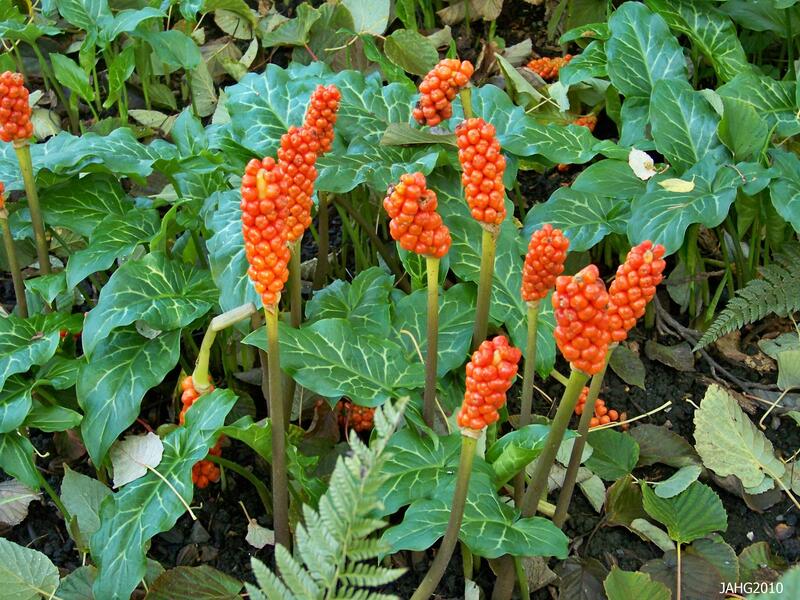 In the case of Arum italicum the tiny flowers’ are usually on very short stems and the spathe is a greenish color. The flowers structures are usually hidden underneath the much larger leaves. Another thing common to Aracae members is they all have calcium oxalate found in all parts of the plants. Calcium oxalate is a chemical compound that is a well-known irritant and anything which has it must be handled with care. All parts of the Cuckoo Pint has calcium oxalate in it. Arum Italicum is a fairly widespread plant and grows wild in southern England most of southern Europe, Northern Africa and into Asia Minor. It is an ancient plant and representations are seen painted on the walls of the Temple of Amun at Karnak in the ancient capital of Thebes in Egypt, the plants are not native to that area. During the 16th century the roots of Arums where boiled and powdered to produce a white starch which was used to stiffen collars and ruffles of the elaborate clothing of the times. Later the same powder was added to cosmetics called Cyprus powder which was used for the skin in Paris. The thick gummy sap of the plants was at the time was collected and refined for use as a substitute for soap for laundry. It’s hard to believe we used this plant for these things as processing it would have been a long slow process and in some cases taking many weeks. The seed heads of Arum italicum on elongated stems beginning to ripen in the early June. Arum italicum has a life cycle which backwards compared to most plants we are familiar with. 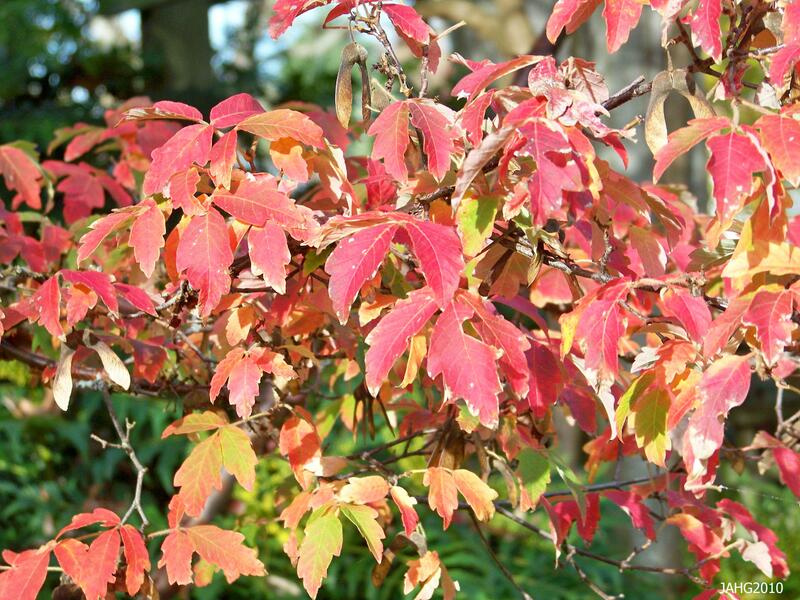 Here the leaves are produced every autumn and winter over into the spring, they area undamaged by frosts. In spring Cuckoo Pint flowers are produced and the foliage later withers leaving the elongating floral stems with the seed developing on it. As the seed is almost is ripe new leaves unfurl in late autumn and a new cycle begins again. The seed ripens and is sown in the winter as it has a short viability and does not tolerate drying out at all therefore the time of ripening guarantees the best chance of germination. The same Cuckoo Pint in late August with the seeds starting to color up but no leaves in sight yet. 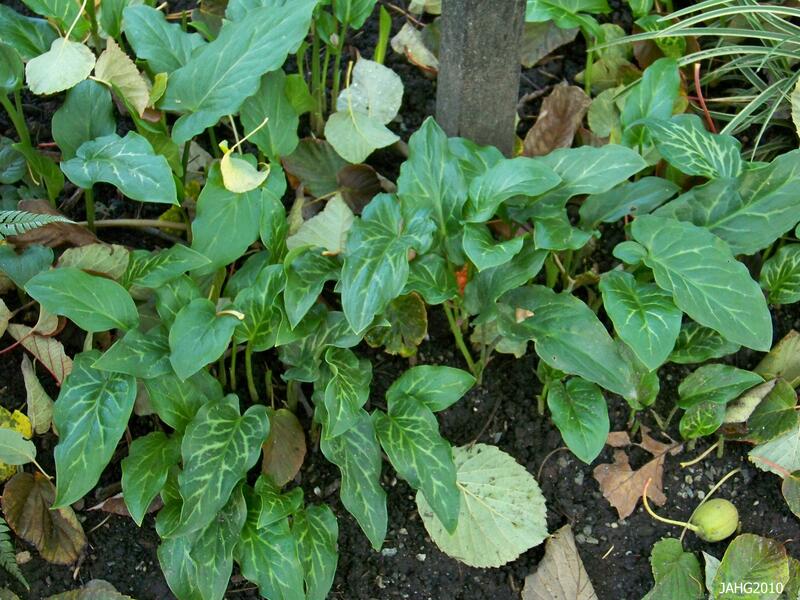 Arum italicun is an attractive plant for the garden and can be used in number of ways. 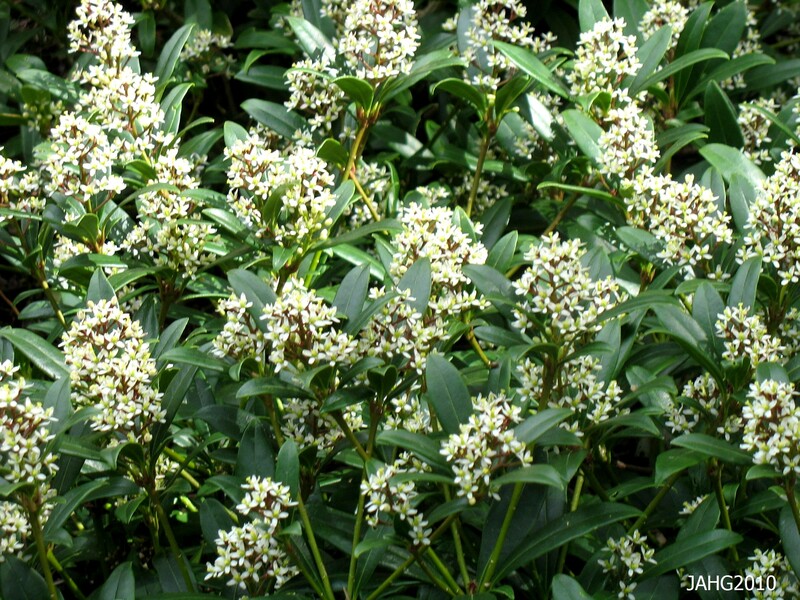 It is very tolerant of shade and even deep shade and can be planted in areas where many other plants will struggle. It is quite a show at this dark time of the year and provides late autumn and winter interest. The bright color of the seeds are noticeable deep in a border or it can be used in a container for a winter show. 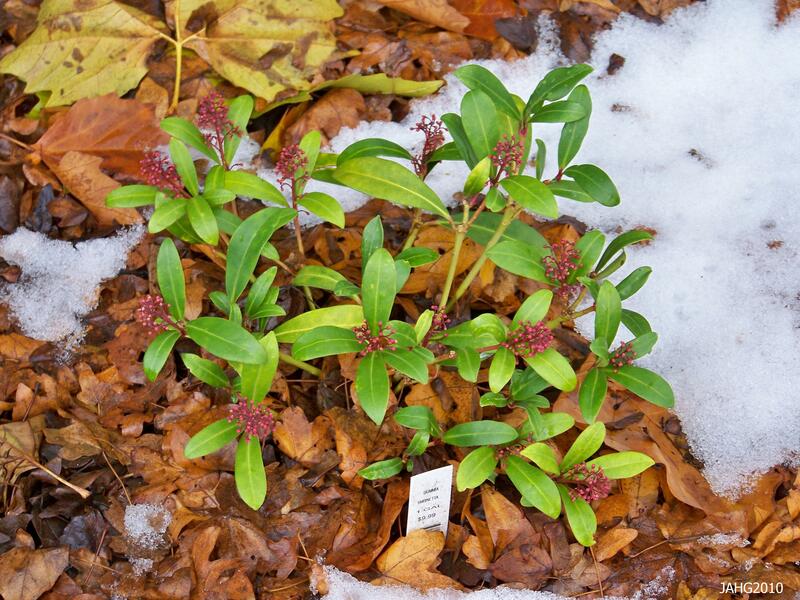 Cuckoo Pints can be placed as accents or specimens and work as a groundcover if they are in a spot where they can naturally produce seedlings. 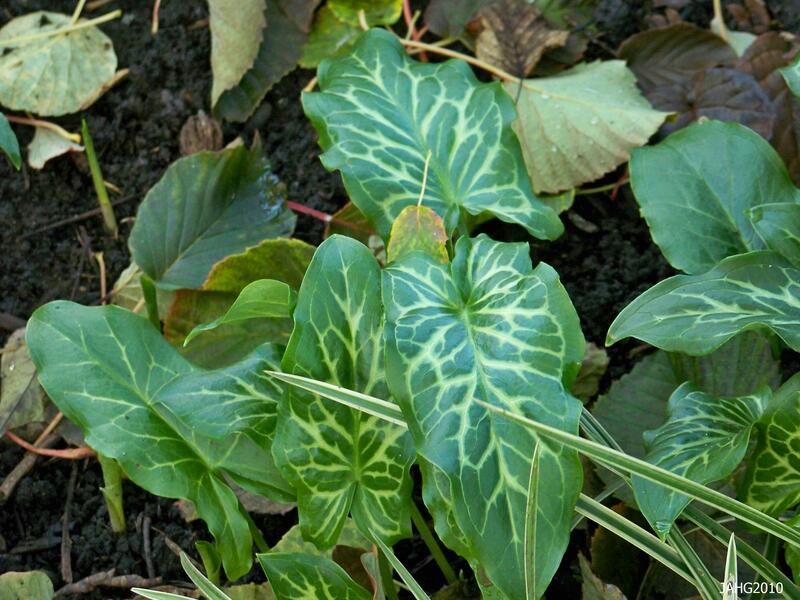 The variation of leave coloring and varigation is typical of seedling Arum italicum, no two plants are identical. Growing the Cuckoo Pint is easy, you need a site with rich slightly acidic moisture retentive soil and full sun to shade. 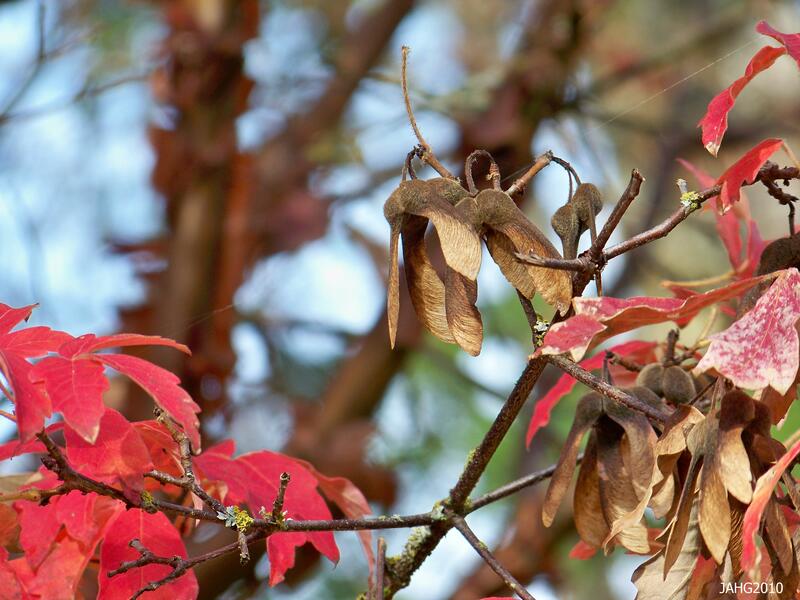 If you like more leaves plant them in more shade and for more seedheads a bit more light. Arum italicum die down during the summer heat and you might need to mark the site so you do not over plant on them. You should consider wearing gloves when handling any part of these plants do to the calcium oxalate found in the plant might irritate your skin. Wash your hands after touching any part of the plant. If you are worried about pets and children eating any part of this plant you might choose to put it deep in a border where they will be less noticeable (except to you). 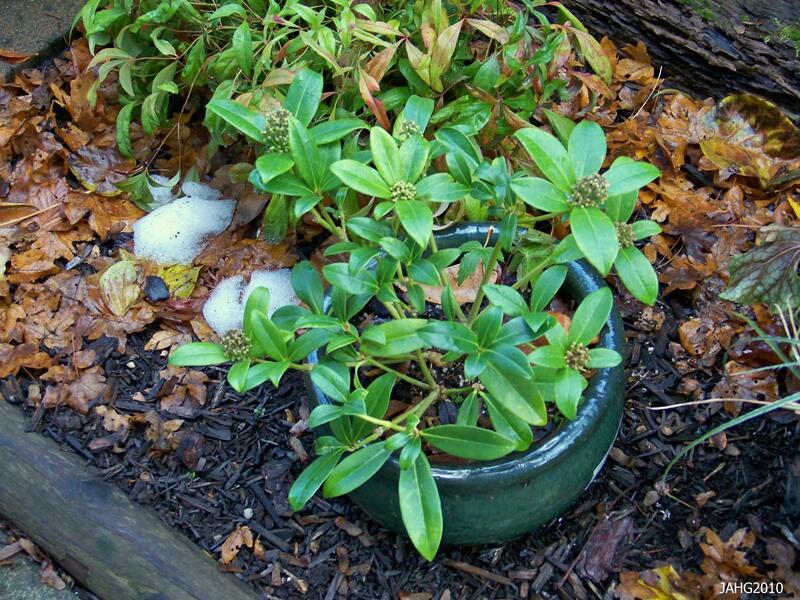 One good thing about this plant is that slugs and wild life generally does not touch it. Propagation is by seed or division of clumps during May and june when the plant becomes more dormant. Here at Finnerty Gardens the Arum italicum has found a happy home and has spread under this Davidia tree. Cuckoo Pints are hardy to -25 c.(-13 f.) or zone 5 through 9. An average plant grows about 30cm(1ft.) tall and wide. Spacing is 45cm (16 in.) apart of you want more of a mass planting. Breeders have become interested in this plant and there are now have selected leaf types which are more marbled and showy, these should become more common in time. Arum italicum ‘Pictum’ for a long time was considered to be separate form has now been demoted to plain Arum italicum. …………Hope you come back here soon………. It was a dark and stormy night and the wind was blowing through the trees in the cemetery as I trudged past. I shivered and pulled my coat collar up to protect me from the chill. As I walked along, the shadows moved and I shuddered as I passed the dark eerie Common Yew (Taxus baccata) trees because I knew that these trees were always sacred to the Druids. It was one of the five great trees that stood in their sacred sites. 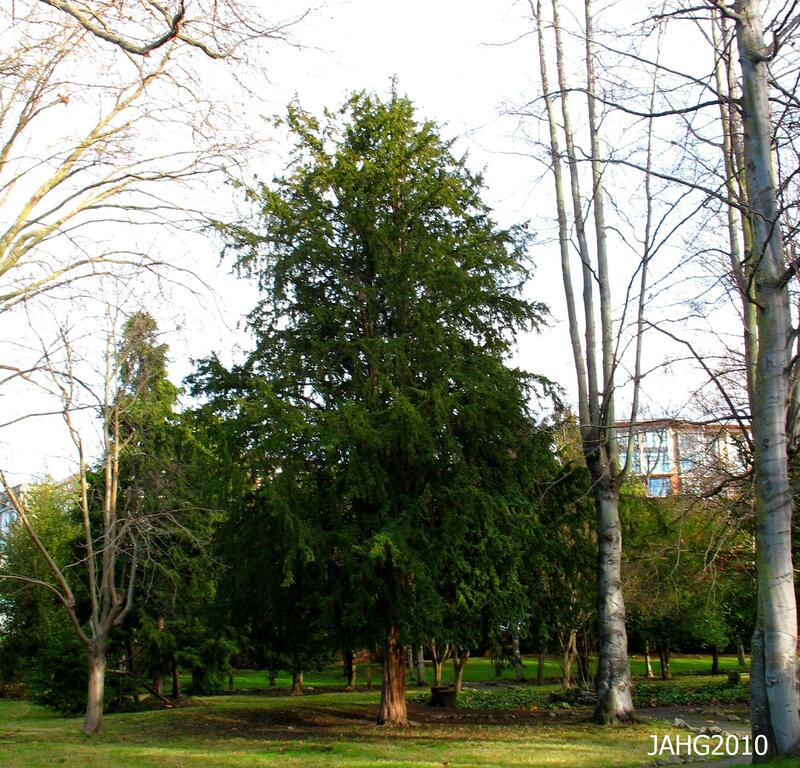 A Taxus baccata as you might find it in the wild which is found at St Ann's Academy. Taxus baccata is native to Ireland, England , through Europe down into the northern tip of Africa and over to West Asia. It is in northern Europe where Common Yew has been a significant tree associated with various early religions and cults. In Norse mythology we meet the Yggdrasil ‘the world tree’. Yggdrasill means Yew (support)pillar leading some theorists to believe this tree is a Yew instead of the traditional Ash(Fraxinus species) Yew are also connected with the ‘Fairy races’ of Ireland and Wales. Many tales connect these trees to fairy rings, mysterious appearances and disappearances. 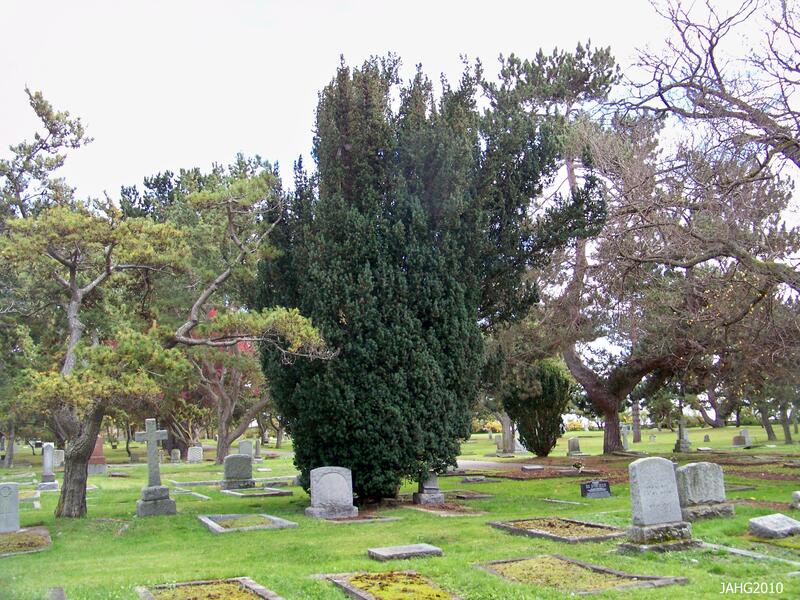 Yew trees in ancient times were placed in sacred sites which later often became cemeteries and church yards. We are most familiar with Common Yews being associated with Druid culture found in Ireland and Wales, during the Iron Age Celtic period. During that time the wood was turned into many symbolic and spiritual articles such as wands, and staffs. The wood was also used for divination purposes and at festivals. In the 19th century a cup made of Yew wood was found near a village in North Wales, this item was likely used in Druidic ceremonies. 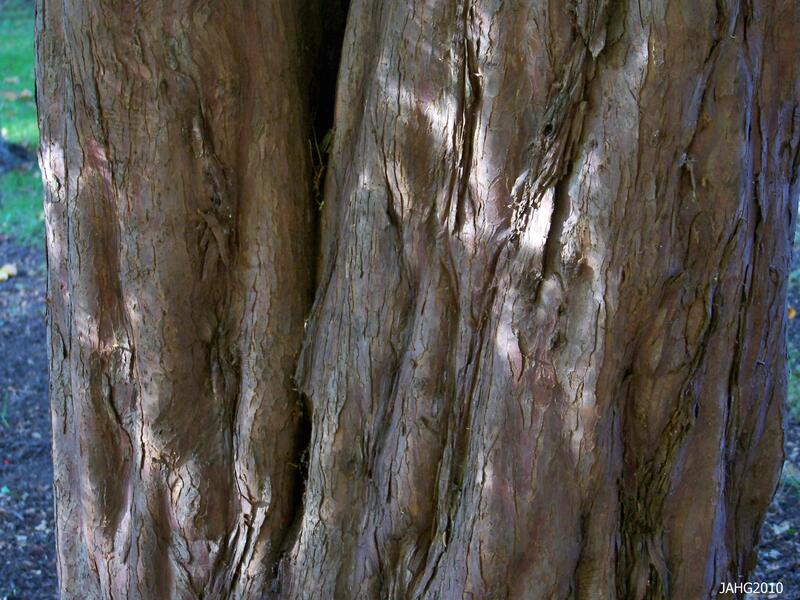 The wood of Taxus baccata is very flexible and was traditionally used for making the deadly longbow of Medieval times. 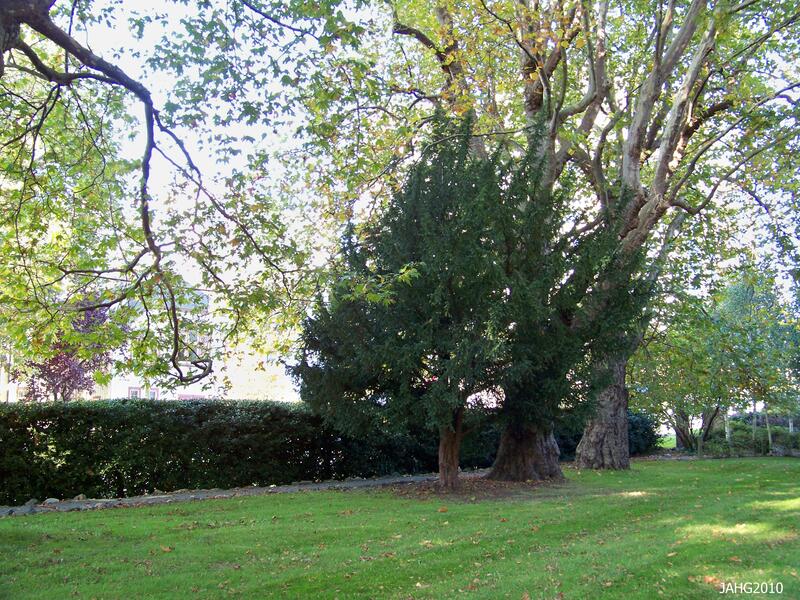 Other places were the Druidic religion likely touches the Common Yew is in their prominent placement in some of the oldest churchyards in Great Britain, Often churches were placed in known sacred places of Druid and other non Cristian groups to help suppress them and usurp the site and ideas related to it. One of the oldest known Taxus baccata is found in a churchyard in North Wales, it is over 4000 years old. Taxus baccata with its dark color and fine needles is often clipped when seen in a garden setting. 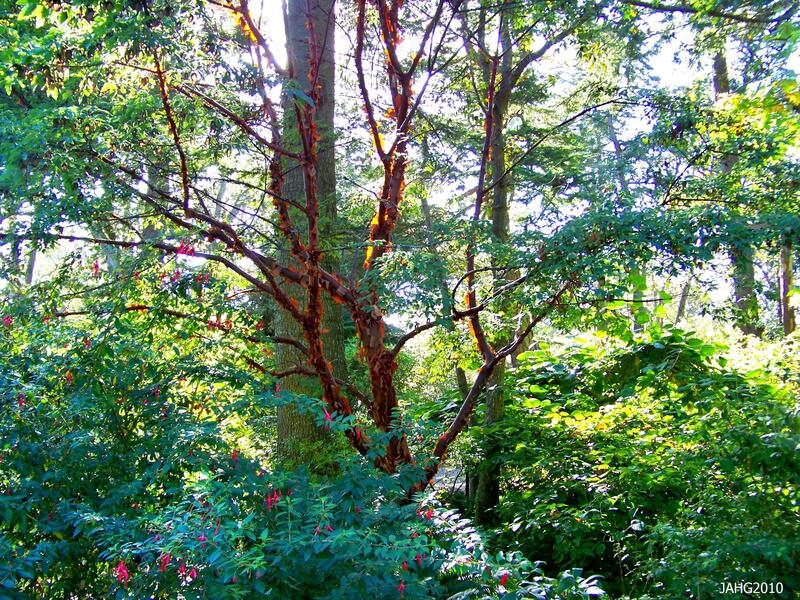 Throughout history the wood of Common Yew has been associated with deadly things. The needles and the flesh of the seeds(arils) is highly poisonous and many people and livestock have died from it. The wood was much used before the use of iron became widespread. It is very hard and resists the effects of water very well. 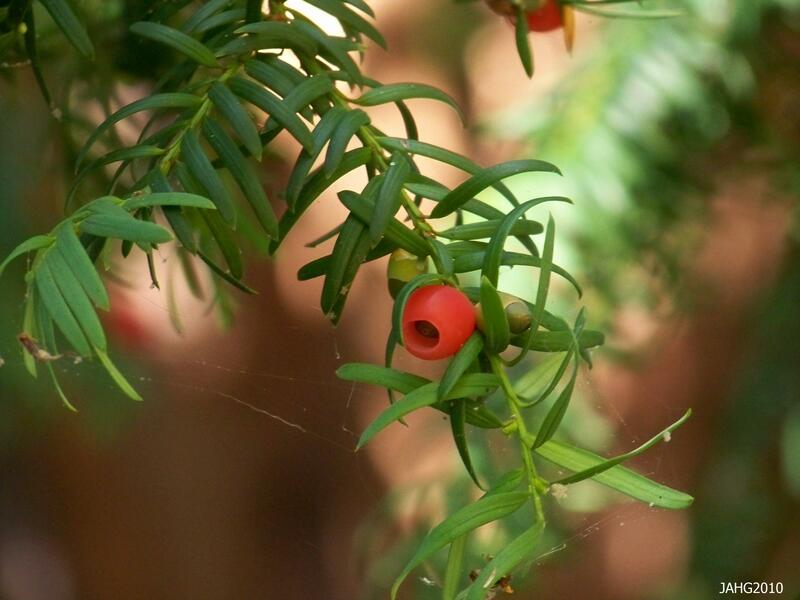 Yew is a tree of death, used for making longbows, coffins, weapon handles and arrow shafts and disturbingly bleeds red sap. The worlds oldest implement, a spearhead is thought to be 50,000 years old and made out of Taxus baccata wood,The famous longbows of the Welsh were made out of Yew and were first recorded in use in 633. More recently it is used for furniture, tool handles and veneer. The wood is golden smooth with a wavy grain. All Taxus species contain deadly alkaloids in all their parts except in the brightly colored arils which cover the seeds. Taxus baccata has a long association with gardens, official and unofficial because they are easily grown and adaptable to many situations. 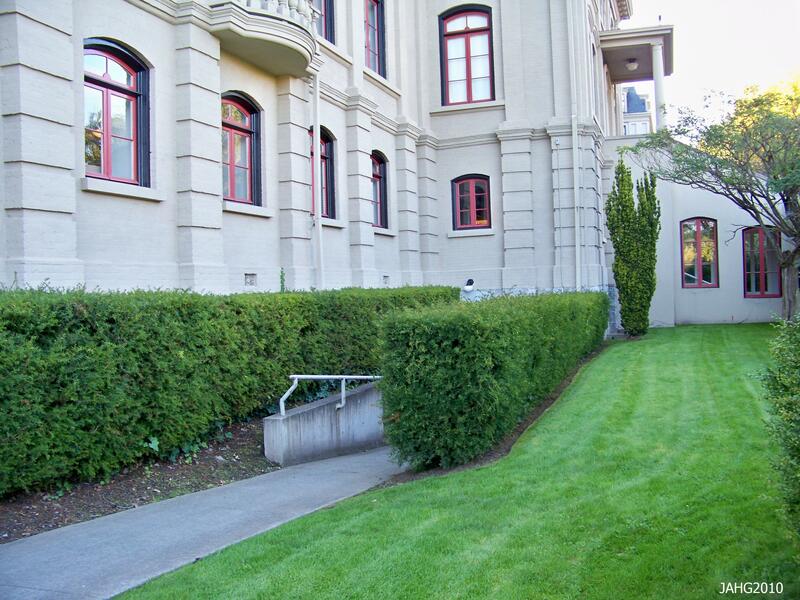 At many large government buildings this tree is used in one of the most traditional ways, as a clipped hedge in the form of Taxus baccata ‘Fastigiata’ or Irish Yew. Taxus baccata ‘Fastigiata’ is the form which we come across most often in Victoria as it is narrower in form. 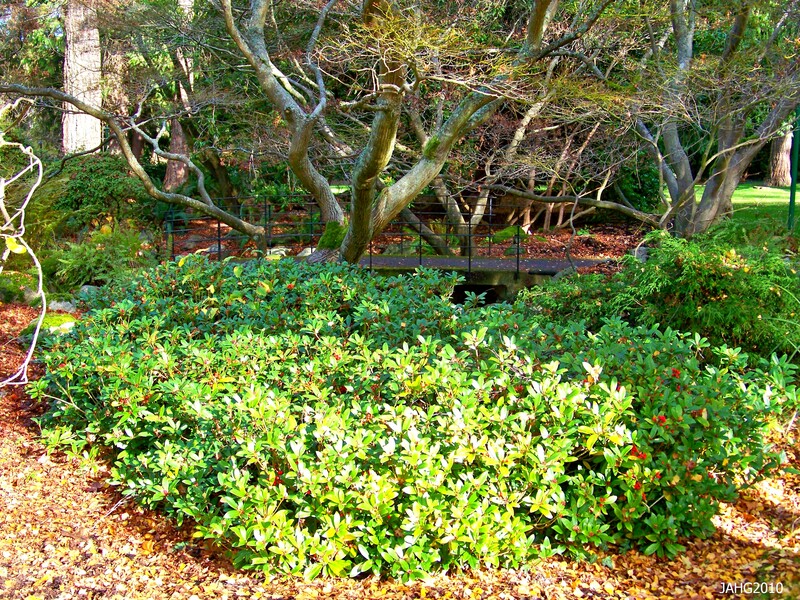 Taxus baccata 'Fastigiata' is used at the corners of the Hardy Fuchsia Garden at Glendale Gardens. 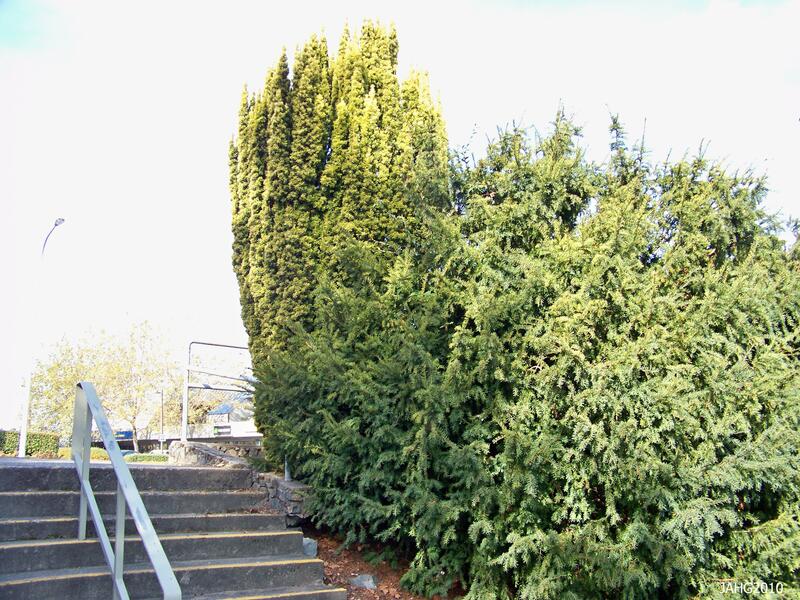 If you want to grow some Common Yew trees, there are somethings to keep in mind. Plants are male or female, with the females having the red berries. Yews can grow in almost complete shade to full sun but seem to be best with more light than less. 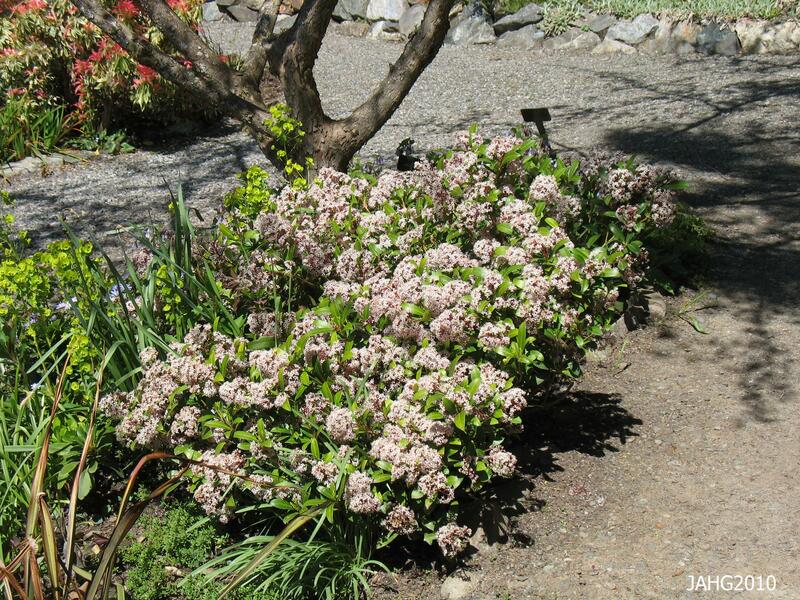 They are slower growing than most shrubs and are more expensive because of this. Over many years they can attain heights in excess of 20m(65ft) and can live several thousand years. They like a good soil which nutrient rich, stay away from clay if possible. A golden Taxus baccata 'Fastigiata Aueromarginata' is seen above a common Yew here at one of the entrances to Hampton Park. 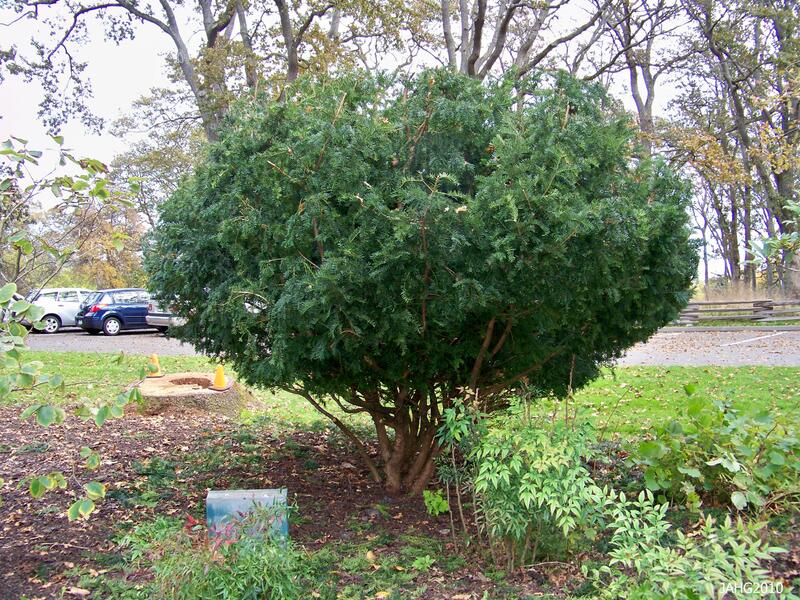 Taxus baccata are fairly drought tolerant and withstand air pollution making them an ideal city plant. 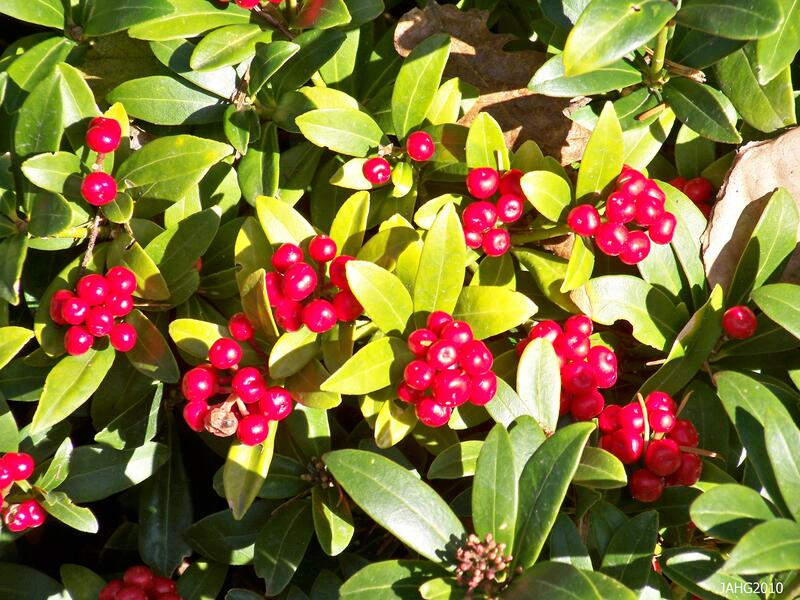 They are rated as zone 6 meaning they can withstand -20c(-10f) although they might get some wind burn damage on their foliage.If making a hedge space them 40-45cm apart and pinch them back at the time of planting to make them bushy. Remember that this will be a slow-growing hedge. You may want to use one of the narrower forms. The Yew hedge seen here is carefully clipped to maintain its shape and condition. 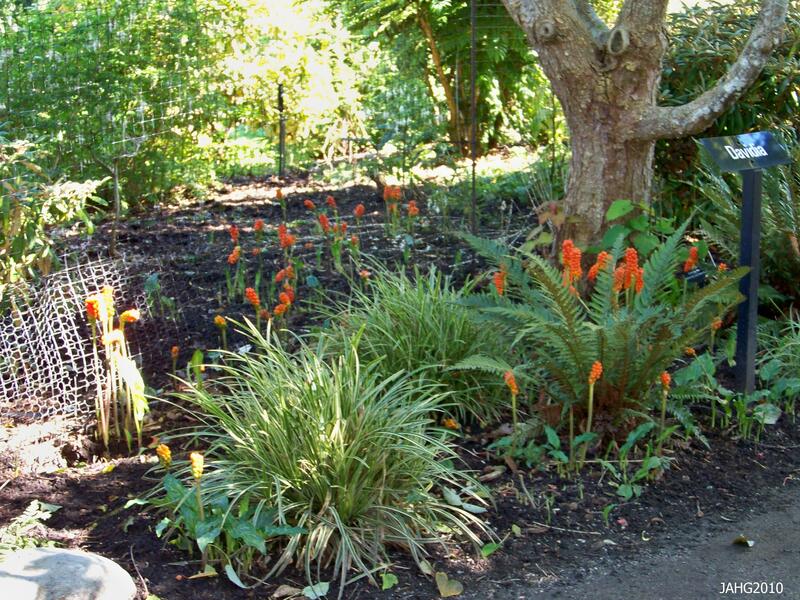 There are several hundred named varieties which have to propagated by cuttings. Most forms are female and may produce seeds. Look for especially narrow forms such as the dark green ‘Fastigiata’ or golden ‘Fastigiata Aueromarginata’ or the female golden form ‘Standishii’ .Taxus baccata ‘Repandens’ has low spreading branches and ‘Cavendishii’ has wide-spreading branches that droop at the tips. This Taxus baccata tree grows in almost complete shade during most of the year yet is very healthy. ….Hoping to see you here soon…..